Left Roca Azul in Jocotopec about 9:30 and arrived at our new home, Garden Hotel Patzcuaro & RV Park near the SE corner of the lake at about 4. In the tongue twister town of Tzintzuntzan we ate in a “cocina economica” for the first time. There’s no menu; you’re shown what’s cooking and you point at what you want. 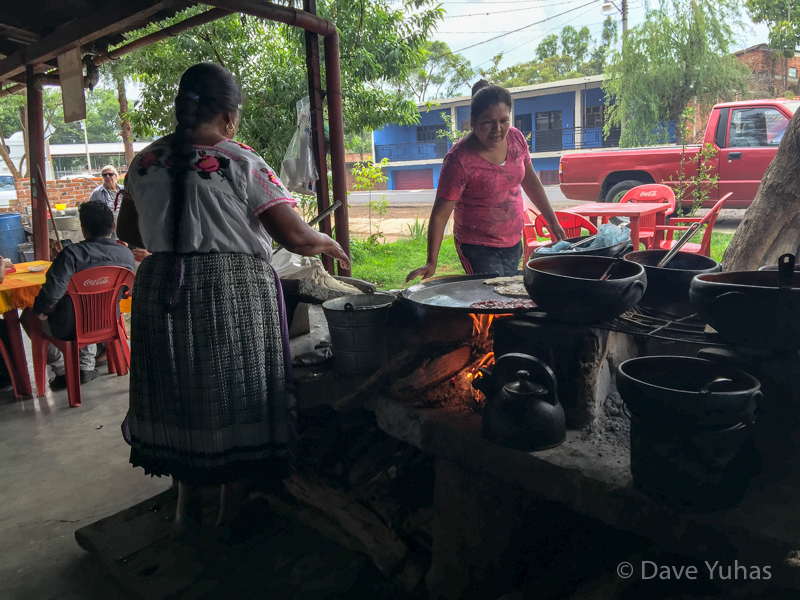 Our meal – meat, rice, beans and tortillas (we watched them being made) with a couple of cokes came to just over $6. Around 6 we took a stroll down to the lake, stopping for helados (ice cream) on the way. Took a taxi back from the lake to evade the bugs. A L-O-U-D thunder & lightning storm started around 9 – the rainy season has begun. The camper’s roof is aluminum. It magnifies the sound of the rain. During the worst of the storm it sounded like we were inside a popcorn popper. And in other news, the camper’s water pump may be failing. The flow from the “kitchen” faucet is a lot less than normal. Next Next post: Lamb. It’s what’s for breakfast.